During tonight’s Emmy Awards, the Shelter Pet Project is also hoping to bring worldwide attention to another homelessness problem: the millions of pets in shelters. Nominees and attendees are being asked to talk about their favorite rescued pets, and to share them on social media with the hashtag #shelterpetlove. The mission of the Shelter Pet Project is to make shelters the first place potential adopters go to when looking to get a new pet. On Friday, a pre-Emmys “secret room event,” featuring free swag for invited guests and their pets, benefited both the Shelter Pet Project and the Humane Society of the United States. 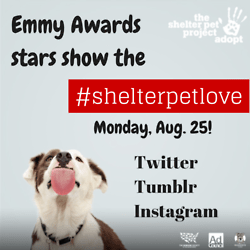 Tonight the Shelter Pet Project will be liveblogging the Emmy Awards telecast, which kicks off at 5 p.m. on NBC, on its Tumblr account. It will also post updates on Twitter (@shelterpets) and Instagram (@shelterpetproject). You are also welcome share a picture and story of your own rescued pet using the #shelterpetlove hashtag. Good luck to all the Emmy nominees, and, more importantly, to all the shelter pets!